The last major silver short squeeze was in 2011. During the 1980 squeeze, the New York and Chicago exchanges halted silver trading several times. Whenever markets were disrupted, the prices quoted in New York did not match the prices buyers had to pay per ounce for actual bars of silver. Premiums above the spot price for PHYSICAL silver coins, medallions, and bars got very high – as much as $10 per Troy ounce. However, people were happy to pay the high premiums, and glad to get silver in almost any form. 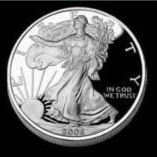 Customers were not concerned about brands, shapes, or sizes of silver bars, or denominations of U. S. 90% silver coins. They just wanted real silver bullion. America was almost in a depression during the 1970s. Economists called it stagflation. We had high unemployment and sky-high fuel costs. And, inflation was terrible. The U.S. economy was in pretty bad shape; but not in the shambles it is today [since the 2007/ 2008 crash]. After the U. S. abandoned a gold standard in 1971, people began buying gold and silver coins to protect themselves from the dollar’s loss of purchasing power. Most coin and bullion buyers were not looking for paper dollar profits. They wanted tangible assets to hedge against a crumbling dollar. Silver was $1.95 per ounce in the early 1970s, when Nelson Bunker Hunt, William Herbert Hunt, and other wealthy investors began accumulating physical silver. They informed the public they would be systematically building physical positions in silver. Dealers understood they were buying the actual metal -taking delivery of silver contracts- rather than speculating in the futures market with paper silver. Over a period of years, silver moved from $5 to about $11 per ounce mid-1979. Silver was more than $30 per ounce at the end of 1979. As silver began moving sharply up in 1979, the bullion banks were facing “fails to deliver” on their open contracts. It was rumored nine directors of the COMEX held massive short positions in silver. The situation was called a silver short-squeeze. At the end of the squeeze, the market was near collapse and the shorts were almost broken. The short-squeeze threatened the very viability of the exchanges. The rules for trading silver on the COMEX (Commodities Exchange New York) and CBOT (Chicago Board of Trade) were changed many times until the squeeze came to an end. The exchanges stopped trading silver several times during the silver short-squeeze (and during its aftermath). There were “limit up” days, “limit down” days, and “liquidation only” days. There was uncertainty in the exchanges, tremendous price volatility, and extraordinarily wide spreads (big percentages between bid and ask). Locking in prices over the phone became risky for customers, wholesalers, and dealers. In those frantic days, people stood in lines half-way around city blocks at coin shops throughout the country, hoping dealers would not run out of silver. People even traded with each other while standing in lines. Supplies of silver bars and silver coins were strained to the breaking point. Time after time, exchanges such as the COMEX and the CBOT raised margin requirements in an attempt to drive the price of silver down, and make it too expensive for investors to stay “long” in the silver market. Then, they limited the number of contracts investors could buy. In New York, customers were limited to 10 million ounces of silver; the CBOT put on a limit of 3 million ounces. In March 1980, the CFTC (U. S. Commodity Futures Trading Commission) finally broke the back of the silver short squeeze. Silver was on its way to $50/oz. The final game rule was changed to stop the price advance. The CFTC banned all purchases of silver contracts, allowing liquidation only. Silver tumbled 50% in four days. The total decline was 78% in two months. After the silver market plummeted, it remained in the tank for more than twenty years. The shorts made fabulous profits. And, those on the other side of the trade lost their shirts. With the price of silver in the $20s, the Hunts were unsuccessful in their efforts to raise capital to pay margin calls. The Hunts declared private bankruptcy in 1980. In the end, Hunt liabilities were $2.5 billion and their assets had been reduced to $1.5 billion. The Hunt brothers were not big enough to fight the financial insiders bankrolled by the Federal Reserve; or powerful enough to counter the actions of the CFTC. In August 1988, the Hunts were convicted and heavily fined for “conspiring to manipulate the market.” The Hunt brothers were not the conspirators. They were the victims of the same short-sellers who manipulate the prices of precious metals to this day. HAS ALMOST FORTY YEARS OF SHORT-SELLING BEEN NAKED? YES. Short-selling has prevailed since the 1980 squeeze. Industry watchdogs believe naked-short-selling (with the help of a few central banks) collapsed the silver market in 1980. They also believe naked-short-selling has effectively managed gold and silver prices for the last thirty years. However, it appears gold and silver prices have not been as effectively managed since the real estate bubble burst in 2007. TAKE A LOOK AT REAL POWER AND REAL MARKET MANIPULATION. Compare the Hunt brothers’ 1980 long position of 100 million ounces with recent short positions held by a small number of banks. A November 2009 CFTC report said just two banks held 68% of all commercial net short positions in silver, and 43% of all commercial net short positions in gold. At the time of the report, seven commercial banks held a combined total of 65,000 open contracts, representing 325 million ounces of silver (short). The seven bank combined total is the largest concentration of short contracts in history. * In 1997, Warren Buffet (Berkshire Hathaway) had a long position in silver of about 130 million ounces – initially at about $4.50 per ounce. Although Buffet was long 130 million ounces (scheduled to take delivery of March silver contracts), he had also sold July future contracts of silver short. His silver buying strategy seems to have been more of a paper trade… However, there is speculation he was compelled to sell his silver delivery contracts because the silver bullion sold for delivery did not exist. The 130 million ounces had been sold naked short.